Does your dog love to swim? Does he or she plunge into the pool at every opportunity? Some dogs, like Labradors, are genetically drawn to water whereas others are either afraid of it or find swimming very difficult, like Pugs and Corgis. 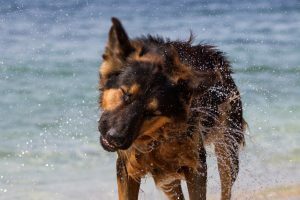 If you’re taking your dog to a holiday spot with water, make sure he can swim. Bulldogs, Pugs, Corgis and Greyhounds find swimming very difficult and breeds like Maltese are susceptible to arthritis and chills. It’s a good idea to consult your vet too, as they will have useful advice specific for your pet. If your holiday spot is by a river, lake, ocean or swimming pool, there are a number of safety aspects to consider. Rivers and lakes often look safe because the water is calm, however stagnant water can carry serious diseases or be susceptible to blue-green algae. Lakes and pools are often chemically treated to a level that’s safe for humans, but unsafe for pets. The most important thing is that you know the area and its dangers. Vets in the local area should be able to advise of any danger zones. And watch out for blue bottles, jellyfish and snakes. There are some great smelling items that wash up on or are left on the beach that can be harmful to our pets if eaten, especially blowfish. Ideally prevent your dog from eating anything unusual and train the ‘leave it’ command before you go. However, if they do eat something you are not sure of, monitor them closely and phone your vet to see if there is anything more you need to do. If your dog tires easily or is afraid of the water, use a life jacket. It’s a good idea to get him or her used to wearing it before you enter the water. If your pet is thirsty enough, he or she may drink chlorinated or salt water, both of which are unsafe for pets. Carry lots of clean water and a collapsible bowl for your pet to drink from. If he’s been in chlorinated, salty or dirty water, it’s a good idea to wash him afterwards. This will prevent them ingesting chlorine or disease when they are grooming. If you are taking your dog on a boat his temperament and physical condition will dictate the success of the trip. A very nervous dog may not enjoy the high speeds of a jet boat; an old dog may tire easily in the water and a dog with a tendency to get overly excited may jump overboard unexpectedly. 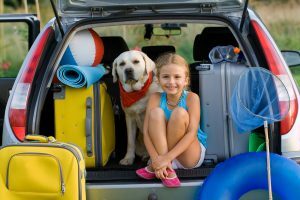 Knowing your dog’s limits will you help you prepare safely for the trip. Use harnesses to prevent him falling out of the boat. This is particularly important for speedboats. 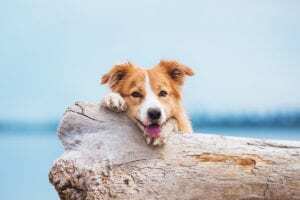 Like humans, pets can get sunburnt and dehydrated. Ensure your pet has some shade from the sun and plenty of water. If you are on the beach, portable shade tents can act as temporary kennels. If you are on a boat, encourage your dog to stay under shade during the heat of the day. Plan ahead for how and when your pet will go to the toilet. If your dog has been trained to only go to the toilet when out walking, you may have trouble on the boat. Arrange toilet stops before boarding. Accidents happen and you don’t want to be caught floundering frantically for a veterinarian in a strange town or resort. Make sure you know where the nearest vet clinic is located and keep an emergency telephone number at hand.